Having experienced success with my Strawberry Jam recipe using the microwave, I thought I would try making some different jam. But what kind? What did I have in the garden? I discovered a small mountain of Gooseberries and Rhubarb, looking like precious jewels just waiting to be squeezed into jam jars. Place the rhubarb into a bowl, ideally a glass bowl so you can see how the jam is boiling. Cook in a microwave oven on high for 4 minutes,the fruit should be uncovered,check the rhubarb you should notice it starting to soften. Add the gooseberries and cook for a further 3 minutes. Carefully crush the fruit again with a potato masher. Add the sugar and pectin and knob of butter and stir. Cook on high for a further 14 minutes, stirring halfway through. Again the fruit should be uncovered. Make sure that the mixture was boiling vigorously for 4 minutes during this time. Ladle into you sterilised jam jars. I sterilise mine in the microwave, but you can just as easily pop them into a hot oven or dishwasher. Remember if you have screw top lids there is no need to add a circle of greaseproof paper on top of the jam. Carefully put the tops on. Once the jam has cooled, label and decorate your jars as you wish. 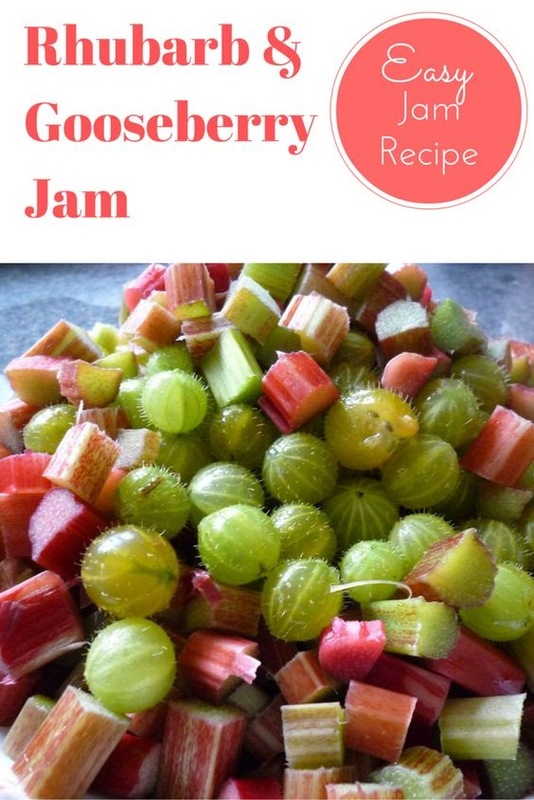 Rhubarb & gooseberry please..i've never eaten this jam. Must be delicious. It tastes wonderful, lovely on toast or a scone - yummy! Thanks for visiting my blog, I'm glad you like the jam. Can you boil the finished jars in a water bath for longer term storage? Thanks for your question. I've never used a water bath to sterilise my jam jars, but I know others do. Although I have used the oven method to store jam for 3 years successfully. Never had gooseberries before so trying it in a jam would be fab! I have just made the Gooseberry (Sweet Gooseberries. The skin is pink in colour) & Rhubarb jam. Can't wait to try it. This has been my first time using either fruit. Do you think if i put fresh mint in with the jam would be good.